ZibdyHealth takes users’ information security and privacy very seriously. We know that our users would like us to hold their medical data with the utmost security. Our databases are encrypted, and data being sent over the internet between our servers and the user’s device is also encrypted. We use 256-bit AES encryption which is far superior to most hospitals or banks in the United States of America. We understand that we will need to earn this trust and we are ready for it. There are more than six different layers of privacy and security in our platform and as a user, you decide how much of your information you will like to share with your private network. User information is never open to anyone outside your personal network. 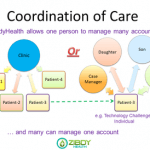 When a user creates an account with ZibdyHealth, he or she is not connected to anyone. Their account is available to them only. Once a network is built up, we allow users to control exactly who in their network of family members, friends and care givers, have access to their information. To connect on ZibdyHealth platform two people have to make a choice and take necessary steps to connect with each other. Upon connecting with someone, there is no more sharing of information until each person gives various levels of permissions to the other such as view, edit, delete and modify. This is taken care of by the Permissions function. The button to operate the Permissions function is only visible if a user has built a network of connected users. This does not include “sub accounts” (such as children), but needs to be independent users who have their own ZibdyHealth accounts. You as a user must grant permissions specifically to each member of your network. The different sections of your information can each have permissions set to Add, View, Delete or Modify data for your account. In the example illustrated, the user has granted “View” permission only on all items to Matt Brown. The information sections are Personal Information, Allergies, Medications, Medical History, Vaccines, Reminders, Vitals, Permissions and Notes. 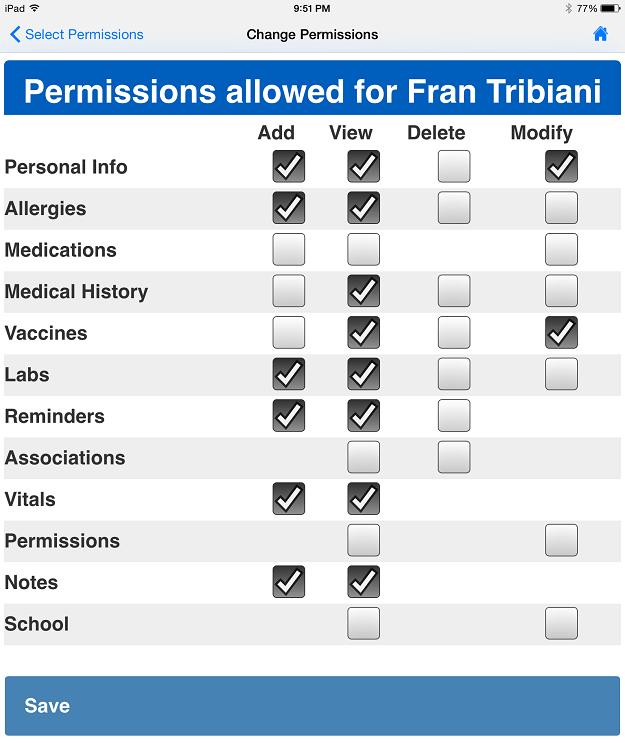 For example, you may want to set your Medications, Vaccines, Allergies, Medical History and Notes to “View” for each family member, but for a doctor or care giver, you may also want to add permissions to add and modify Medications and Notes, as well as add Reminders. If you have a friend in your network who you are caring for, you may not wish to give them permission to do anything with your account, so you wouldn’t need to add anything for them. 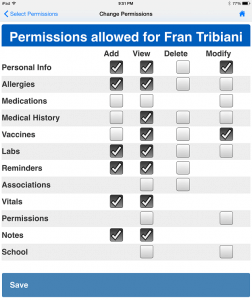 Medications cannot be deleted, Reminders cannot be modified, Vitals cannot be modified or deleted nor permissions added or deleted by any member of a user’s network. Medical information is often the most personal information we can have and ZibdyHealth allows users to precisely control access to specific items within each section. Certain medical information is often only comfortably shared with medical professionals, and kept private from family members. 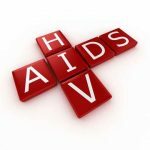 This can include anything, but items that individuals want to keep private can include things such as STD treatment, birth control medication and for some individuals even such things as weight control medication. ZibdyHealth platform allows its users to mark any particular item “private” even when rest of the section is shared with family and/or caregivers. A single click from “Private” button will hide the particular item from everyone even if you are sharing your medical history with others. Yes, we do allow exceptions to this “private’ button in case you would still like to share your private marked information with your caregiver or other specific persons in your network. ZibdyHealth is a lot more than a private social network. Unlike other social networks which are mostly useless to a user unless they are connected with others, ZibdyHealth is very helpful for a person to build their medical history, check drug interaction for OTC drugs before they purchase by scanning the barcodes in the store, keep track of vitals, treatment options, insurance and doctor information and lot more. A user will get all those benefits and more without ever connecting to anyone but when a user connects with their family or caregiver, he or she will get a lot more benefit from ZibdyHealth platform without doing extra work. Please check out our tutorial section tutorial section or help page to learn more about security and privacy of your data and don’t forget to give us your feedback at support@zibdy.com and we will strive to make our platform more useful.